The Central Oregon Sportsmen’s Show is the largest in the region. And this year the show celebrated its 20th year! Thanks to Central Oregon’s gracious support the Central Oregon Sportsmen’s Show continues to grow and evolve as the ebb-and-flow of exhibitors and exhibits changes with the passing years. 2019 was no different with LOTS of new things to see and do. Also, thank you to everyone who stopped by my Pursue The Wild booth for the second year in a row. My sister Lesley and neice Haley both came out to give me a hand and have some fun at the show for themselves. It was a great weekend and we are already looking forward to the 2020 expo. It was a great weekend shooting the California Precision Rifle Series match. This was my first match of the year having taken the fall off for hunting season. Overall for a warm-up match I finished out alright by beating my previous top finish by two places finishing out at 37th. My was better than ever with my Ruger Precision Rifle chambered in 6mm Creedmoor which shooting lights out. I did add an ARCA rail to the forend of my rifle which really added performance and ease of snapping in and out of tripods quickly and allowed quick detach of my bipod. My rifle was topped with my Nightforce Optics ATACR 7-35x56 scope shooting Hornady 108gr ELD Match. This match was my top placing finish to date at a national match. My goal is to always finish in the the top 50th percentile of shooters which I constantly maintained. As always, I owe a huge thanks to my coach Jake Vibbert. And thank you to my entire squad- Jake Vibbert, Paul Dallin, Gregory Harris, Morgun King, Ji Zhang, Garret Preece and Jeremy Swanson. Turkey Hunting: What’s In Your Pack? Turkey season has arrived which means we are packing up our gear in preparation to hit the field. In addition to our tried and true turkey essentials, it’s not too late to make a few additions of some great new products, just in time for turkey season. Click HERE to read my latest article for GunsAmerica #Hunt365. Obsession doesn’t just make bows, they make bows to be better. In the latest episode of Tips From The Wild, Kristy Titus shares why she made the switch to Obsession bows. In this podcast Buck Obsession TV, Steve Lewis sits down with Kristy Titus in a Q&A session and talk about her story, the hunting industry, hunting and what she is passionate about. She also talks about her Pursue the Wild digital platform series. This is a must watch interview. In this episode of Pursue the Wild from Season 1, Kristy Titus takes you through her personal journey to Train To Hunt from knee reconstruction to overcoming all obstacles, taking the finish line with her partner Krista Magnussen who has also overcome her own physical challenges to compete. Train To Hunt- simply the purpose that inspires us to overcome whatever it is in life that is holding us back. This episode is dedicated to always being your best self, giving 110% because you don't cross finish lines with excuses. My latest podcast on Her Inspired Journey Podcast with Courtney LeVesque is LIVE on Sticher, Podbean, Google Play and Spotify. The episode is full of good tips on healthy eating, sticking to goals, keeping cheats “clean” and giving yourself grace through the process. We also talk about some of our favorite Wilderness Athlete supplements, the 28 Day Challenge, growing up hunting and more! Courtney LeVesque brings raw, and authentic inspiration to women pursuing their dreams, enjoying the outdoors, and balancing life. With a combination of solo and featured guests you can find topics on motivation, health and fitness, hunting, preparing for backcountry treks and more. Tune in every Monday for a new episode and a weekly dose of encouragement. After four busy days, the 2019 Western Hunting & Conservation Expo (Hunt Expo) closed on Sunday February 17 after over 54,000 people passed through the Salt Palace Convention Center. For the second year, Kristy had her Pursue The Wild booth featuring her signature jewelry by Montana Silversmiths, information about her digital series, Pursue The Wild and more. Titus made appearances at the Rocky Mountain Hunting Calls booth promoting her Pursue The Wild elk calls, The Wild Frenzy, Wild Fury and NEW Wild Thang, plus the Cabela's and Mule Deer Foundation booth. The Wild Sheep Foundation Convention and Sporting Expo better known as "The Sheep Show®" is an outdoor and mountain hunting expo. The exhibit halls feature more than 400 exhibits, including Kristy Titus's Pursue The Wild booth featuring information on her digital series, jewelry by Montana Silversmiths and more. Whether participating in backpack races, evening banquets, incredible live auctions, sheep hunt raffles, or a cruise through hundreds of outdoor industry exhibitors, attendees found themselves surrounded by like-minded conservationists at every turn. There are some people that are completely selfless and give their heart and soul for the betterment of others. Every year, Nevada Grassie offers his time and talent to support his brothers in arms. This year Kristy along with the support of Nightforce Optics was honored to contribute to Nevada with his custom 300 blackout, "A Warriors Legacy." The walnut stock was hand carved along with the gorgeous carved dall sheep horns. Proceeds benefited both Wounded Warrior Outdoors and The Wild Sheep Foundation. Titus’s seminar, “Early Season Elk Tactics – Create the Frenzy” discussed pre-rut and peak-rut archery elk hunting strategies along with both cow and bull sounds featuring her Pursue The Wild series of elk calls the Wild Frenzy bugle tube, Wild Fury diaphragm and Wild Thang external reed cow call. Great American Outdoor Show Seminar "Making The Shot Of A Lifetime"
Kristy Titus, NRA Certified Instructor, hosted a positional shooting seminar at the The Great American Outdoor Show, Making the Shot of a Lifetime in Harrisburg PA.
Discussing how to build a solid shooting position from the ground up, fundamentals of marksmanship to include natural point of aim. 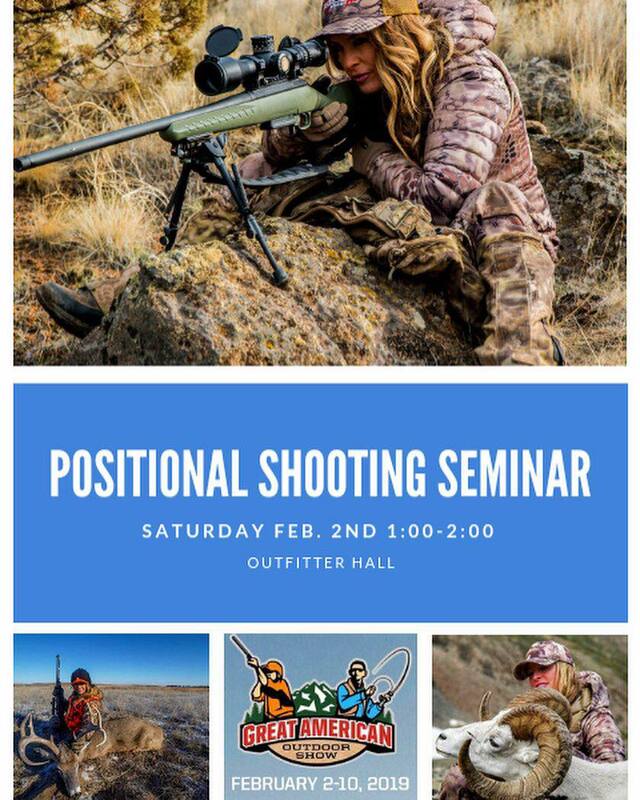 Other topics covered, selecting a natural object for a support, how to properly use shooting sticks and tripods and more. Kristy Titus, NRA Certified Instructor, hosted a positional shooting seminar at the The Wild Sheep Foundation National Convention Making the Shot of a Lifetime along with Sean Murphy, Director of Commercial Training at Nightforce Optics. We discussed how to build a solid shooting position from the ground up, fundamentals of marksmanship to include natural point of aim. Other topics covered, selecting a natural object for a support, how to properly use shooting sticks and tripods and more. Kansas is well-known as home to a thriving population of whitetail deer but is also home to a small population of free-ranging Rocky Mountain Elk. In this episode of Tips From The Wild, Kristy Titus shares how elk populations have been restored to the Kansas Flint Hills. And the efforts that the Rocky Mountain Elk Foundation has done in the area to benefit all wildlife, including the growing elk population. In the latest episode of Pursue The Wild, Hunters, Whitetails and Conservation, Kristy Titus ventures to Kansas in pursuit of whitetail deer. During the episode, she takes a look back to the early 1900's, where whitetail deer populations were rapidly declining. Today, thanks to the North American Model for Wildlife Conservation, spearheaded by hunters and the support of organizations like The Rocky Mountain Elk Foundation, whitetail deer numbers exceed 32 million nationwide. This is a true story of how hunters are the first crusaders in conservation. Welcome back to the Talking Lead Podcast. Buck Knives is the Official 2019 SHOT Show “Leadquarters”. In this wild episode we bring in the class, talent, intelligence and beauty of the outdoors industry! Hunter, conservationist, and TV star Kristy Titus, Women’s Outdoor Clothing mogul Norissa Harman & helping Lefty host this interview is Country Music Artist, and a Lead Head herself, Morgan Mills. The latest issue of Western Hunter Magazine is available now! Pick up a copy and read my latest article “Keto Craze” Is A Ketogenic Diet All It’s Cracked Up To Be? Covering more than one million acres, the Little Missouri National Grassland in western North Dakota is the largest such grassland in the United States. However, getting to it is a real challenge in places because of surrounding pieces of checkerboard private lands. Glenn Myers and his family own one of those pieces of private land—a ranch that borders the Little Missouri River. It’s also offers prime habitat for elk, bighorn sheep, whitetail and mule deer, mountain lions and other wildlife. Struggling with ongoing deer raids on his haystacks, Myers reached out to North Dakota Game and Fish for help. The state suggested he enlist his ranch in the North Dakota’s Private Land Open to Sportsmen programs. RMEF stepped up too, footing the bill for 20 percent of the cost. The result is a 10-year public access agreement so the public can hunt both his 1,700-acre ranch and the thousands of acres of public land beyond. Opening and improving public access is a key facet of RMEF’s conservation mission. Buck knives is no stranger to manufacturing interchangeable blade knives. The improved Buck Selector 2.0 is redesigned and improved with more replacement blade options than ever before. Featuring three interchangeable blades, drop point, drop point serrated and gut hook, this robust knife makes blade change outs simple and safe. Sold separately are a hoof pick, skinner, clip blade, and small game blade. Watch the latest Tips From The Wild where Kristy Titus puts the Selector to work afield. Obsession doesn’t just build bows to be different. They build them to be better. Built to take adventure to the next level. Obsession’s new OB Trax cam system carries the same smooth draw characteristics that you love from Obsession bows. For shooters like me that have a shorter draw length or lighter draw poundage, The OB Trax cam delivers speeds that we have never before reached. The OB Trax cam delivers an industry leading, 90% let off. Allowing archers to wait for that perfect shot opportunity. Longer hold times allow you to intensify your focus for terminal shot placement. Spend more time afield with ability to make minor adjustments without the need of a bow press. Practice makes perfect. Trusting in equipment makes all the difference. Built for adventure, built to Pursue The Wild.